Today we discuss about automatic transmission. We all use bikes and cars. We all know that we need transmission box or gear box to change the torque according to driving condition. In earlier we used manual gear box in which there is a hand or foot operated lever and clutch through witch we shift the gear according driving conditions. But know the trade is changing and the vehicle moving towards automatic transmission. Now days many cars and scooters used automatic transmission which are easy to handle and user friendly. But a question is arising that how the automatic transmission works? Are we using the conventional gearbox in automatic transmission or there is other arrangement? Will we change our manual transmission vehicle into automatic transmission without changing the gearbox? Today I will discuss on that topic and if any question arise in your mind kindly put in comment box. I will revert back you soon. Before starting this post fist you read the following post. In the manual transmission we used sliding mesh or synchromesh gearbox but in automatic transmission we used epicyclical gear box. This type of gear box uses no sliding dogs or gears to engage but different gear speeds are obtained by merely tightening brake bands on gear drum. It consists of a sun gear, pinion or planet gear and the ring gear. The ring gear contains teeth on it inner circumference and it surrounded by a brake band. The brake band is operated by the hydraulic pressure exerted by the hydraulic oil. This is control by the electronic sensor or the movement to vehicle speed, load and the accelerator valve opening. 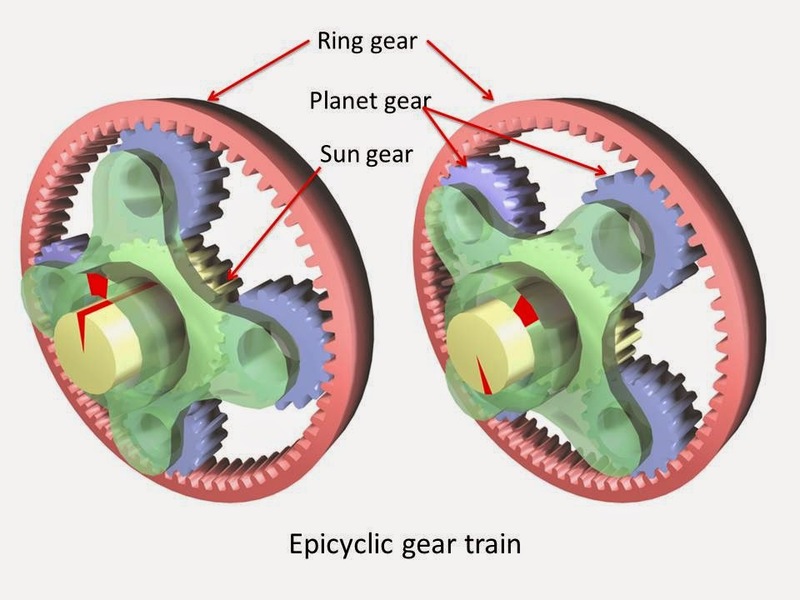 The planet gears are in constant mesh with both thee sun gear and ring gear and are free to rotate on their axes carried by the carrier frame which in turn is connected to the driver shaft. When the ring gear is locked by the brake band, the rotating sun gear causes the planet gears to rotate. Since the ring gear cannot move. The planet gears are forced to climb over it. During this position, the ring gear acts as track for the planet gears to move over. The driven shaft which is connected to the planet gear carrier is thus rotate. When the ring gear is released, it is free to move in consequence to the rotation of planet gears which rotate around their axis. During this position, there is no movement of planet carries and hence the driven shaft remains stationary. A planetary gear box contains a numbers of such units to obtain various speed reductions. The main component of the automatic transmission is the converter housing case, oil pan and the extension housing. The converter housing encloses the torque converter and the case contains epicyclical gear train while the extension housing encloses the output shaft. The oil pan is bolted to the case. The entire transmission unit is attached to the engine block by means of bolts through holes in the converter housing flange. The automatic transmission is same work as the manual transmission except it is control by the brake arrangement operated hydraulically. In the automatic transmission the engine shaft is connected to the clutch and the further connected to the turbine of the torque converter. The torque converter drives the ring gear of first gear train through a free wheel. The drive of the ring gear of the second gear train is then taken form the planet carrier of the first gear train so that the two act in series. This arrangement gives three forward and one reverse speed by subsequently application of brake. The selection of the particular gear and application of corresponding clutch and brake is done hydraulically. The hydraulic pressure I regulated by the car speed that control oil pressure on one side of the shift valve and the throttle opening controlled by the driver through the accelerator pedal which controls oil pressure on other side of the shift valve. Today we have discussed about Automatic Transmission : Principle and Working. If you got any query kindly ask by commenting. If you have any query regarding this article, don’t forget to share it on social networks. Subscribe our website for more informative articles. Thanks for reading it.